The Draw: If the Golden Quarter is the heart of Soviet Alma-Ata, then Malaya Stanitsa is the heart of Verny, Almaty's tsarist iteration. Here you'll find a gorgeous cathedral, a historic cemetery, and a bazaar that's been running for over a century, but one thing you won't find is other tourists, because the neighborhood is bizarrely off the map. 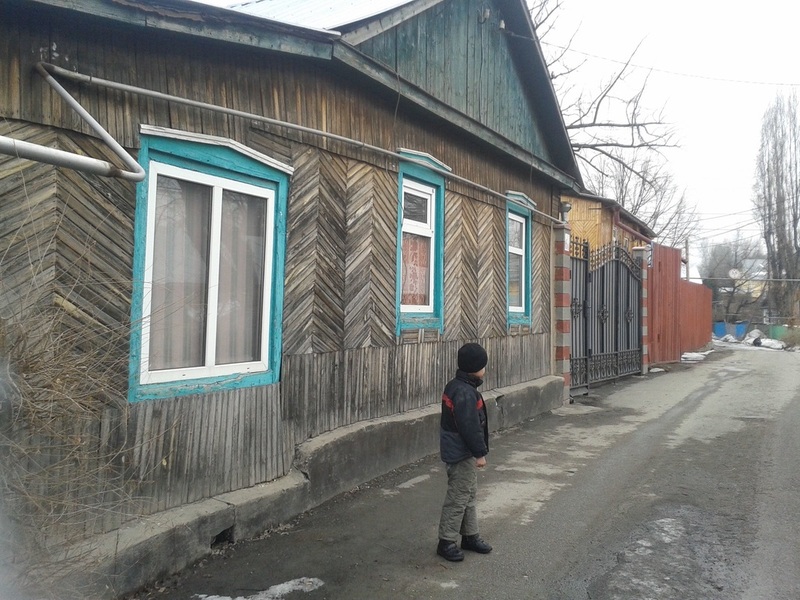 Treasure the solitude as you wander the oak-lined streets, where you'll find Almaty's finest wood cottages, built by Cossacks and inhabited since by various deportees like Turks and Germans. 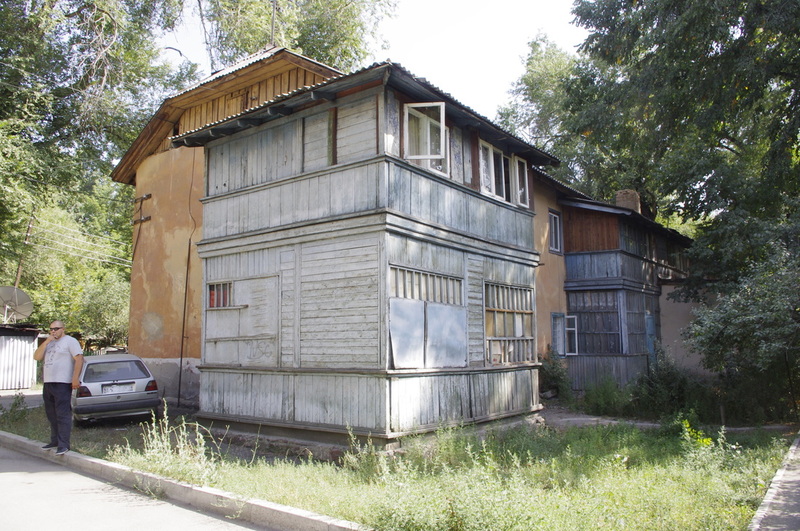 Carved windowframes and fascia boards, wooden slats and gables define the distinctive local architecture, while Soviet leftovers like hand pumps and gas signs remain outside homes, however rusted. Walk deliberately, with a careful eye, and you'll find yourself zigzagging across the streets, camera finger twitching. Nearby Attractions: Admire ancient icons at Kazan Cathedral, or check out the Sunday pigeon market at Vernensky Bazaar nearby. A few blocks north of Khaliullina there's a grown-over cemetery, and along the Malaya Almatinka river you can find an abandoned fur factory. How to Get There: From Rayimbek Metro Station, Bus 11 goes every fifteen minutes; get off before Tatibekova takes a sharp right into Khaliullina. If you're coming from the center and have a fair amount of time and stamina, it's perfectly reasonable to get there on foot, walking through the other historic regions of Bolshaya Stanitsa and Tatarka along the way. 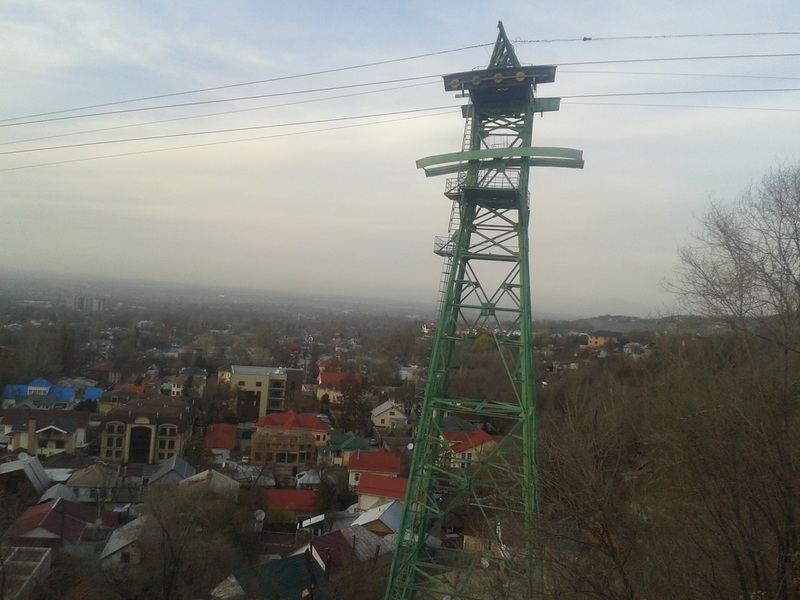 The Draw: Of all of Almaty's chastny sektory, or cottage neighborhoods, Kompote may be the most seen, if only because it lies right under the path of the Kok Tobe cable car and tourists get to gawk from above. Yet venture in on foot and you'll find a tight-knit community that's worth exploring more intimately. The neighborhood gets its name from a local fruit drink, because the streets bear names that come from berries, and though a recent trend for remodels and McMansions means it's not as quaint as it once was, you can still find wooden homes on Bogenbai. The newer homes, it should be said, do have some pretty fun metal gates and masonry patterns, while Kompote's older homes feature more Soviet mailboxes than almost anywhere else. Nearby Attractions: To the north you can find Esenberlin Street for a back entrance to Almaty's famous Gorky Park, or go south and stroll along the gorgeous Terrenkur riverside park (it starts behind the Palace of Schoolchildren). You can find an old Soviet mosaic if you peek over the walls of the Tuberculosis Center on Bekhozhina (don't worry, the disease should be contained). How to Get There: On foot from the center, you can just walk to the end of any of the "Batyr" streets, like Kabanbai or Bogenbai, or you can walk to the back of the Palace of the Republic and cross the canal. The closest Metro stop is Abay; a ton of buses running up and down Dostyk will get you there too. The Draw: Pervaya Alma-Ata, or "First Almaty", is the name of Almaty's northernmost train station, and the neighborhood around it, built for the railroad workers, is especially historic (though admittedly shabby). Amongst the locals, it's a place to shake your head at, with Seifullina Street being especially famous for its hookers and hoodlums. As far as I can tell, that's all nighttime drama; during the day, the neighborhood is as inoffensive as can be. Instead of a trouble zone, I see it as a place of subtle charms. Behold the modernist steel boxes issued decades ago for trash pickup, visible in the dozens near Akan Sery, or the modest homes guarded by rhombi and horseshoes. Closer to the train station you'll find some neat dvukhetazhniki, two-story apartment buildings with wooden loggias and quaint dormer windows. 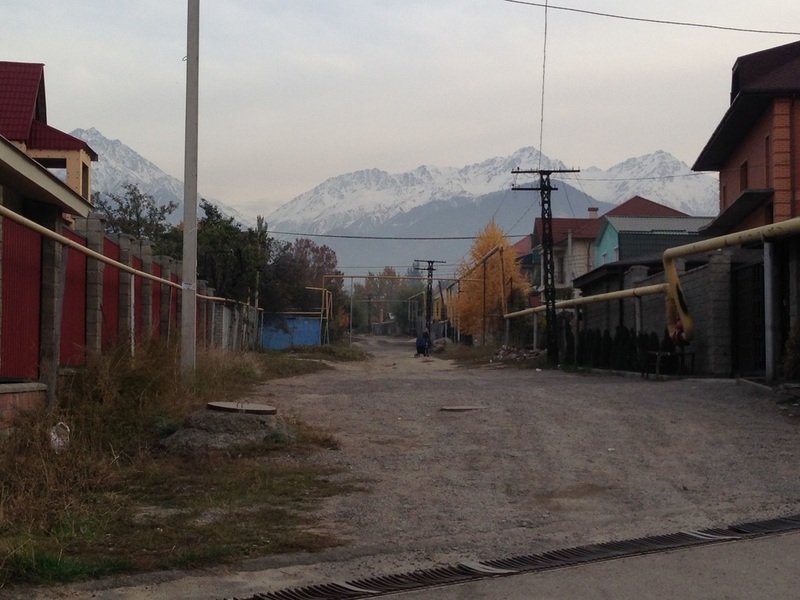 If you're coming into Almaty by rail, this can be your first adventure, just a hop, skip, and a jump away. 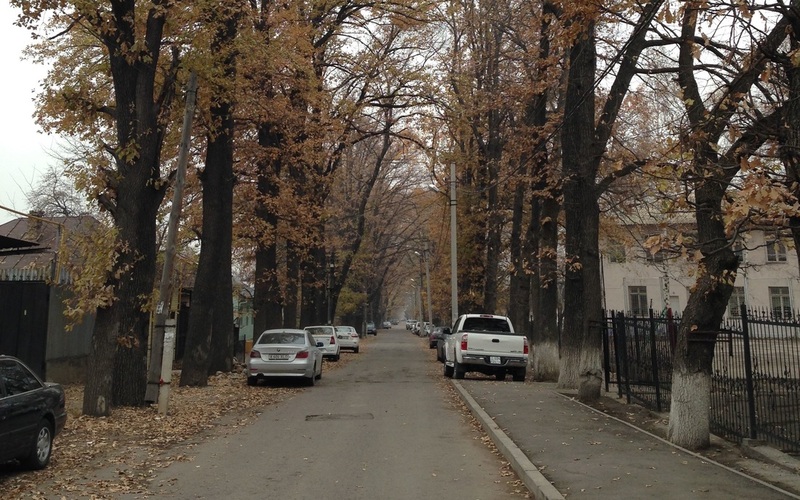 Nearby Attractions: Almaty's vast forest park, Baum's Grove, lies across a creek along the eastern edge of Pervaya Alma-Ata; many of the streets over there just fade right into it. Two blocks down from the train station, in Seifullina Square on Sholokhova, you can find one of the city's two forgotten Lenin statues, and this one's a rarity because he's seated, looking ponderous. The really adventurous can take the pedestrian bridge across the tracks to Pyatiletka Turksiba, one of Almaty's most far-flung frontiers. How to Get There: Those coming from the center of town will want to take Bus 34 up Seifullina; those coming from the rest of Kazakhstan just need to step out of their train car and start walking. The Draw: Gorny Gigant is famous to Almatians for its cheap Central Asian cafes, called uzbechkas, and indeed, with its foothill location, it's an ideal place to sit outside on a tapchan (an elevated eating platform) and slurp up some noodles. 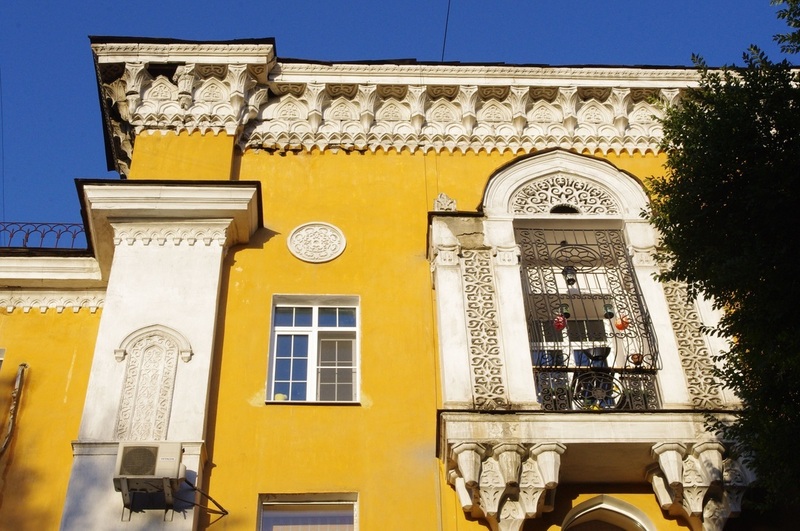 But once you're done with your meal, take a walk around the surrounding neighborhood to appreciate a corner of Almaty that's really one-of-a-kind. For decades, the city never reached this far, and this was a quiet quarter of rural dachas, summer homes where people kept gardens, the gardens made vegetables and the vegetables were canned and pickled. This DIY spirit survives to the present day, as people convert their homes into uzbechkas on a budget, sell flower bulbs on fold-up tables outside their homes and hawk goat milk from their courtyards. Keep an eye out for old address plates and coal sheds, and make it up here fast; Almaty's nouveau-riche are escaping the smog down below for these peaceful environs up above, and the quaintness might not last for long. Nearby Attractions: Gorny Gigant is bordered to the north by Al Farabi Boulevard, home to many glass-and-steel office buildings that locals take selfies with to feel fancy. Dostyk to the east will take you up to Almaty's famous Medeu ice stadium if you wait for bus 26, and to the west is the river Vesnovka, canalized and pedestrian-popular below the highway but stony and wild above it. Both make for a good add-on jaunt. How to Get There: Buses 2 and 73 regularly go up Furmanova street and reach the end of their route in Gorny Gigant. 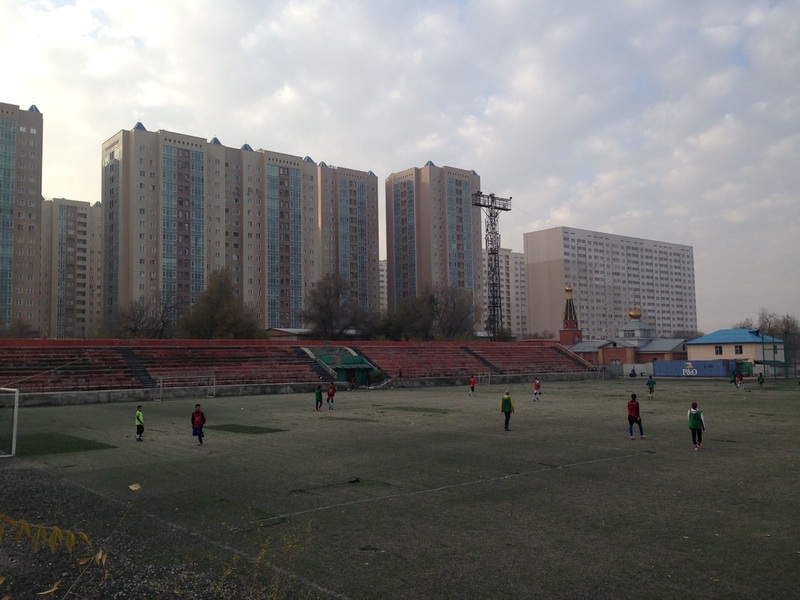 The Draw: Zarya Vostoka, or "Dawn of the East" in Russian, is the quiet buffer that surrounds Almaty's massive Barakholka bazaar in the northwest of the city. Many locals can tell you about its community of Uyghurs, Muslims from China who speak a Turkic language similar to Kazakh, but beyond that they're likely to draw a blank or wonder why you'd ever want to go there. Granted, it's certainly awkwardly located, wedged between the city cemetery and an industrial zone, but that oasis status just makes it more of a delight. Along the main road, Bokeikhanova, you can find Uyghur barbecues and homes decked out in ornamental plaster, and if you head west from there, you'll find an attractive creek with cute little footbridges. Be on the lookout for stray gravestones, places where the nearby cemetery has somehow slipped its bounds. Nearby Attractions: This makes a great side trip for tourists checking out Barakholka, the bazaar so mad you'll be thirsting for a quiet antidote like this, and though morbid, the cemetery is a fascinating place to explore, full of rusting Orthodox crosses and ornate marble mausolea. How to Get There: From the Rayimbek Batyr metro station, take Bus 13 that runs down Tashkentskaya Street. It'll drop you off on Bokeikhanova, from where you can slip into quiet Zarya Vostoka. 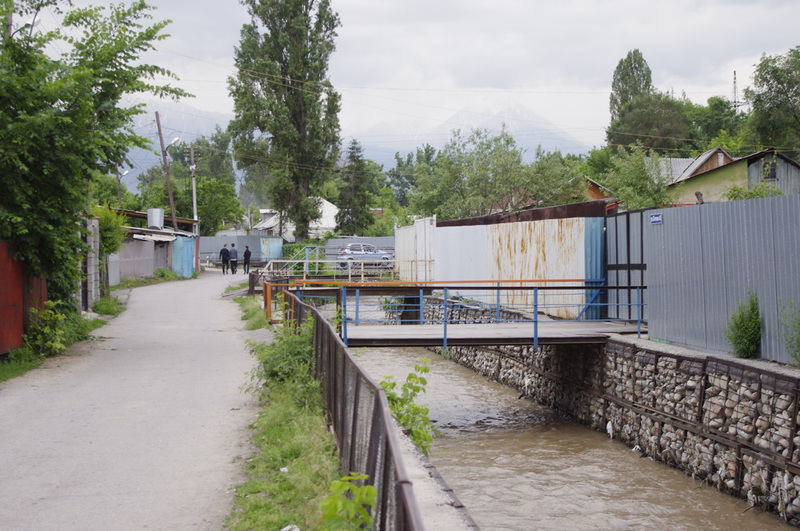 The Draw: There's no better place to grasp the often odd dynamics of Almaty's urban planning than in this zone east of Sairan, a dried-up reservoir. A grid of 1960s cottages somehow survived in the center of town, and then in the last ten years somebody decided to build a fleet of high rises right in the middle of it, so that garish apartment blocks (locals call them "Manhattan") rise absurdly over defenseless homes made of mud, reeds and plaster. Admire the modest homes with their windowframes and eaves, yet note that many still have outhouses; folks in the new developments have shiny Chinese toilets, but then again, the faux-granite facades on their buildings are already falling off, while the cottages down below are holding up quite well. Nearby Attractions: "Lake" Sairan next door is usually a mud pit, but as a Soviet-era "rest zone" left to die, it's got an interesting history and is good for those who like things gritty. North of the neighborhood is Tastak Bazaar, less grand then the central Green Bazaar but easier to navigate. How to Get There: A new metro station called Sairan just opened on Abaya; just walk out of the station and head north. 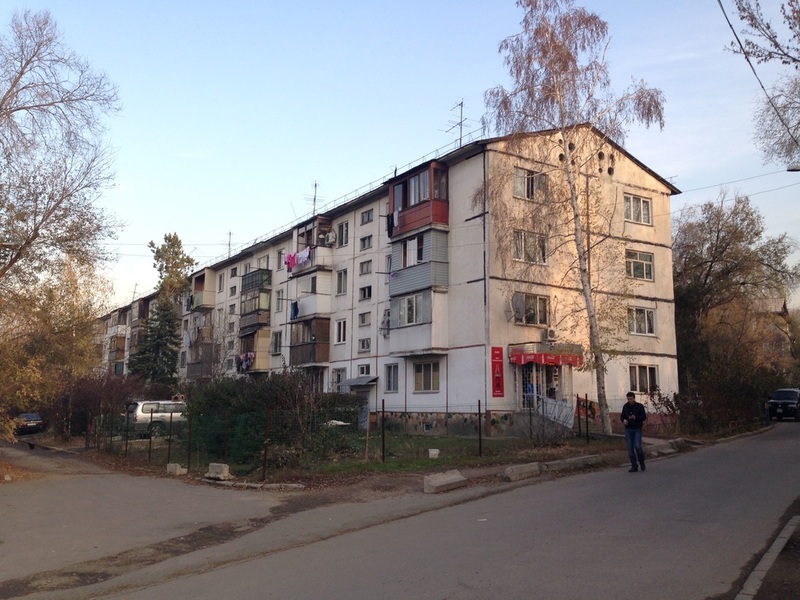 The Draw: In Almaty, there are plenty of mikroraiony scattered about, so-called "microdistricts" that Soviet planners saw as the segmented, self-sufficient future units of urbanism. They've got socialist names like "Road Worker", "Orbit", and "Star" and they've got their own schools and services and such. Yet tell somebody you're going to the mikry, as these zones are also called, and they'll understand that you're headed west, to the land west of Altynsaryn Street, where the microdistricts were planned on such a vast scale that they don't even have names - there's just Microdistrict 1, Microdistrict 2, all the way up to 11. In satellite images, the mikry form a very distinct green clump in the grey city, because the long apartment rows were given such generous breathing room, with trees and gardens in between. The gardens, actually, are a highlight, many homeowners decorating their plots with tire sculptures or figures of carved wood. But most of all it's a fun area to explore because, wandering from courtyard to courtyard, from one numbered zone to the next, it's so easy to get disoriented that every new sight feels like a lucky find. Once I was thrilled to come across a metal pigeon coop on stilts; another time I found rows and rows of homes, studded with rainbow tiles. Go see for yourself. Treasure could await you, hidden in a district whose number you'll soon forget. Nearby Attractions: Family Park in Microdistrict 4 is an entertaining collection of rusty amusement park rides, and behind the Sary-Arka movie theater nearby there's a sad little square with demoted Soviet statues, including the once-proud Lenin who used to stand in the central square. How to Get There: The final metro stop, Moscow, now takes you to the front door of the mikry; otherwise there are a ton of buses that run there down Abaya. The Draw: I knew I was in love with Alatau when I turned the corner on a small street and found idling sheep, the owner nowhere to be seen, the herd guarded only by the mountains that loomed overhead. I had found some kind of pastoral ideal, but what made me laugh was that I was just a ten minute walk from a cluster of concrete housing blocks called Kazakhfilm, named after the Soviet studio. Alatau used to be a collective farm, or kolkhoz, and though these days it's been appended to the city of Almaty, it hasn't lost its sense of isolation. Its cottages are finely preserved, with charm in unusual excess. Facades are decorated with plaster grapes, tin roofs have the year they were built carved into the ridge, and covered porches seem to be half-glass. Many of the homes, it turns out, are inhabited by Meshket Turks and Balkars, and when you go back into Kazakhfilm after your walk, you can try their khichiny, oily dough filled with cheese, at a local shop. Nearby Attractions: The Bolshaya Almatinka river runs west of Alatau, and if you cross the long and narrow metal footbridge, you'll find yourself at First President's Park, Almaty's trendiest recreational area. How to Get There: Bus 127, which runs down Furmanova, makes its final stop at Kazakhfilm; simply get out and walk towards the mountains. The Draw: Roscha Bauma, or Baum's Grove, is often called "The Lungs of the City." It's a long strip of forest running through the lower part of town, a river on one side and train tracks on the other. There was a time when it had a shady reputation, like New York's Central Park in the 80s, but its undergone something of a rebirth. I have fond memories of riding a mountain bike to a picnic there, eating Russian salads in a small meadow, a horse tethered to a tree nearby. Roscha's name and wild energy have leaked over to the cottage district next door, where quiet creeks run between wooden homes and pigeon fanciers live on every block. It's places like these that are so pleasant I almost want to keep them for myself, but no, take them, fellow walkers, make them your own, stroll their streets and fall in love. You'll soon find that Almaty isn't one place, but a collection of hidden corners, rarely-covered ground that's waiting to get the attention it deserves. Nearby Attractions: The nearby attraction, of course, is Roscha Bauma, but to the east is the Almatinsky Rybopitomnik, or Almaty Fish Hatchery, a weedy park for recreational fishing that seems to have more stray dogs than it does fishermen. Actually, I'm not even sure that it's open to the public anymore. Whatever. Go check it, be brave. How to Get There: Bus 79, which runs from the airport to the center of town, actually goes down Shemyakina, this area's main thoroughfare, so if you're an especially adventurous new arrival, Roscha could be your first Walking Almaty adventure. Other buses like 121 and 74 run from the center as well, some going down Potanina, another main street.